← The Mind Explorers – London premiere and live Q&A, come and say hi! These past couple of weeks I’ve been reading like mad. Suddenly there is so much new stuff to learn and the books landing on my radar are just amazing. If you are interested in a book carefully cataloguing various stories of spiritual enlightenment (and ways to achieve it), read ‘After the ecstasy, the laundry. 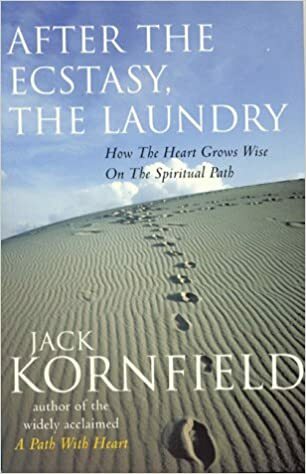 How the heart grows wise on the spiritual path’ by Jack Kornfield. Below are 3 quotes on how to transform boring tasks or chores through mindfulness. Washing dishes or folding the laundry will never be the same! Each small thing, each moment is a contribution to and a reflection of the whole. Tucking a child in bed, paying the bills, listening to a business associate, paying the attendant at the gas station, writing a letter or typing a memo, meeting over a meal, planning a job, watering the garden – each becomes the embodiment of the awakened heart. It is amazing that we can forget this truth. I used to quietly sing a mantra of compassion with each dish that I washed, each floor that I cleaned. And I included the prayer that as I clean, may the eyes and hearts of all beings around me be clean and purified, made innocent and clear. Time would stop as if I was part of the earth cleansing itself in spring. It was a beautiful way to work. The simple physical tasks are the entry to learn to be with this world in a sacred manner. …each act can be done for the Beloved. Embodying mindfulness, we fold the laundry as if folding the robes of Jesus or Buddha, we serve a meal not for ourselves or our family, but for the Holy One. This entry was posted in quotes and tagged enlightenment, happiness, happy, jack kornfield, meditation, nomad, spiritual, universe. Bookmark the permalink.